As flu season is reaching its peak for this year, recent estimates from the Centers for Disease Control and Prevention (CDC) show that between 8 and 9 million people have already been sickened by the respiratory virus so far this year. 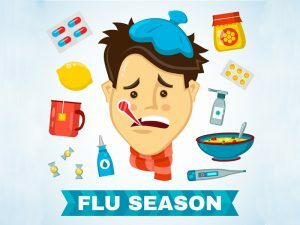 While the flu can strike at any time of year, the typical “flu season” begins in October and reaches its peak between December and February – with most flu activity dying down by May. Preventing the spread of flu is a top public health concern in the US, especially for vulnerable populations like the very old, the very young, and the immunocompromised. According to the CDC, more than 80,000 people died from the flu during the 2016-2017 season, while 900,000 others were hospitalized. Getting the flu vaccine is the single most effective way to prevent the flu every year. Each year the seasonal flu vaccine is specially-formulated to protect against the influenza viruses that research indicates will be most common during the upcoming season. Although the ideal time to get the flu shot is before the end of October, it is definitely not too late for this year. For your convenience, the friendly staff at Medallus Medical can provide flu shots on a walk-in basis. This may seem obvious, but staying away from people who appear sick can protect you from getting sick. This is especially important in situations where you may find yourself in close quarters with others – such as in an office or on public transportation. 3. Stay home when you are feeling ill.
Make sure to stay home from work, school or running errands when you feel yourself getting sick. This will not only protect others from catching an illness from you, but it can also help protect you even if you do not have the flu currently. You are more likely to catch the flu when your immune system is weakened. 4. Cover your nose and mouth. If you feel a cough or sneeze coming on, make sure to cover your mouth and nose. This can help protect the people around you from getting sick. Unwashed hands are among the most common ways the flu is spread. Washing hands can help protect you from germs you may pick up from touching public objects, such as doors or office supplies. If soap and water are not immediately available to you, use an alcohol-based hand rub to kill off any lingering germs.